On Tuesday, April 10, Engine, a nonprofit arts organization located at 65 Main St. in Biddeford, hosted Salt Institute’s “Documentary for a Day” projects. The complete project consists of 10 short films depicting the lives and people of both Biddeford and Saco. 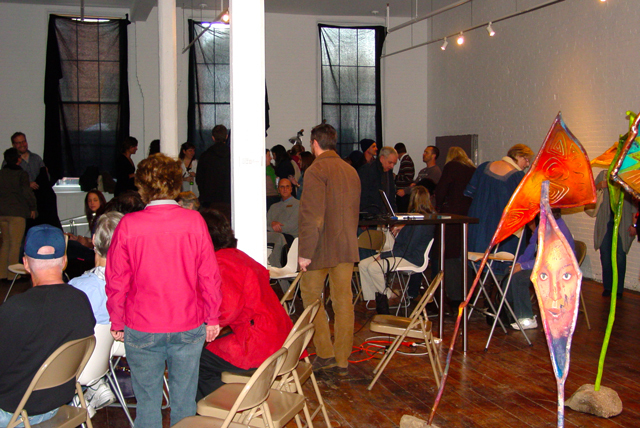 Approximately 50 people filled the gallery space at Engine to view work of the students, and many of their subjects were on hand to see the results of their interviews. The films will be on display at the Salt Institute gallery starting on May 17 and will become part of their permanent archive. Maisie Crow, the student’s multimedia instructor, told the crowd that she hoped the students would learn “that even the most ordinary (people) can become special. For more information about the Salt Institute for Documentary Studies, and their programs, you may visit their website at http://www.salt.edu, and be sure to check back here for a more detailed story about the stories they produced.